I go to the shopping mart and fills up with full of various life necessities into large cart, and then make a payment with a credit card at the cash register nicely. I put goods in my car and leave the mart. We have become accustomed to so fast in this shopping culture. However, whenever I visit traditional markets, the vividness and vitality of life what I was not able to be felt in the big marts leads me with the feeling something like a strong magnet attracts my heart. 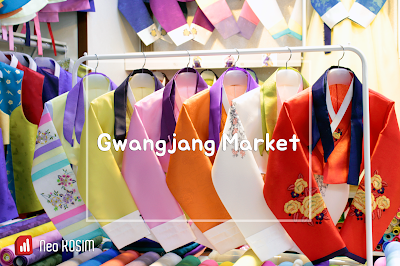 I wonder if this Gwangjang market, which is loved by all generations in its own color, is the case of typical local market within hustling and bustling Seoul. A market famous for Bindaetteok(빈대떡,mung bean pancakes), gimbap and beef tartare bibimbap. Was this market simply famous for its food? You can easily meet people carrying cameras and capturing the full of real market in this place. The world is changing rapidly and even though everything is convenient and has good quality, ironically the value of the traditional market is getting to aware again by the people who miss the nostalgia for our old customs and want to put such an image on the camera. The cheaper and more affordable meals that fit the taste of young people also made a big contribution as icing on the cake. As listening to the story of the typical pancake food corner in this market, it is said the recipe of pancake in the past as well as now is the same, especially from the twenties come to visit the market, the market is particularly revitalized by them and this pancake quickly went viral and became a famous food standing in line to eat. This food place inside market started as a zone to sell foods for fabric traders at night and retailers who pick up things at dawn, and most of all, while starting to be loved by twenties and became a place to be loved by twenties as well as all the generation. Let's take a look at the history of this place over 100 years (opened in 1905). In the early days, rice, grains, and fruits and vegetables were sold mainly. After the Korean War, it maintained its name from hand to mouth. After they changed into the main selling items as professional fabric wholesale and retail for Hanbok (traditional clothes of Korea), it hit a new peak from the end of the 1950s to 1970s. However, western clothes became so more popular and the demand for Hanbok decreased that the role as a mecca of Hanbok market had been shrunk in large portion. it resulted in gradually to walk the path of decline. In Korea, Hanbok is still a necessity for major events such as weddings. Although it is not like the old days, here still plays the same role as the mecca of Hanbok market, which is mainly composed of hanbok, textile, related accessories, bedclothes and goods for traditional ceremony to pay respect to the (bride)groom's family by the newly-wedded couple right after their wedding. For this reason, beautiful hanbok and its related products could easily be seen than other markets. On the 2nd floor, there are many kinds of traditional souvenir goods for tourist. I always love to go to the market. Whenever I look around the market fully filled with generous sense, fresh high quality of agricultural and marine products and affordable price, I always get many bags which fresh things were put in it in my both hands. The scent of life comes along also. I went out to the market hoping to be a place that I loved for a long time. We lost so much of precious life stories as we changed rapidly during short past decades, didn't we?